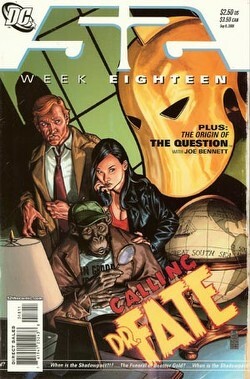 Back-Up Story: "The Origin of the Question"
Terri Thirteen, Detective Chimp and Edogawa Sangaku arrive at the House of Mystery and find the door to the room they wanted to enter locked. Terri believes that the locked door meant the other member of the Croatoan Society, Tim Trench, hasn't gotten there yet. The group discovers Tim sitting in the study wearing Dr. Fate's helmet. Terri reaches out to touch Tim and he melts away in a puddle of water. Black Adam and Isis present the Question with the Order of the Crescent, the highest honor Kahndaq bestows on those not born on her soil. Adam is annoyed that Renee Montoya has not joined them. The Question attempts to explain that Renee is still upset by having to shoot the girl at their wedding the previous week but Adam doesn't seem to understand the problem. Adam confronts Renee, who is drunk and in the company of an attractive young woman. Renee doesn't back down, which angers Adam and he grabs her by the throat. Isis and the Question feel that her grief and his anger are misplaced and the group turn their attention to the real problem; Intergang. Detective Chimp brings Dr. Fate's helmet to Ralph Dibny, who has been hiding out in France to get work through his recent problems. Ralph agrees to help figure out what happened to Tim Trench and asks Detective Chimp to call in the Shadowpact. Clark Kent covers the funeral of Booster Gold. Skeets chose Cincinnati for the event because it didn't have the anti-Booster Gold mentality that other cities did. While discussing the funeral with Kent a passerby distracts Skeets. After doing a quick genealogical scan Skeets discovers that the man, Daniel Jon Carter, may be an ancestor of Booster Gold. The Shadowpact and Ralph Dibny bring the Helmet of Nabu to its birth place to uncover the mysteries of its recent history. Suddenly the helmet begins speaking to Ralph and welcomes him to the Tenth Age of Magic. It explains that the forces of magic obey new laws and axioms and that for far too long those who have dabbled in magic have forgotten one important rule; nothing comes without a price. Tim Trench found the helmet but didn't want to go through the ordeals that must be endured and rites and rituals that must be learned before assuming the mantle of Fate and thus he ended up as a puddle on the floor. The Helmet makes Ralph the offer to guide him through those ordeals and rituals, but warns him that the trials the journey offers are beyond his imagination. Ralph accepts and departs with the Helmet. Enchantress asks the rest of the group if anyone else thought that Ralph believed the Helmet was talking to him. "The Origin of the Question"
From an early age Charles Victor Szasz was looking for answers. This led to his career as an investigative reporter in Hub City. The city was rife with corruption and doing something about it would require a level of anonymity. One of Sage's former college professors, Aristotle Rodor, developed a substance called pseudoderm, which was made from the extract of the Gingold plant. When exposed to a certain gas the substance would mask Sage's appearance while allowing him to breathe and see normally. Sage used the pseudoderm in his fight against corruption as the Question. Main Story - 4: Well, that was unexpected. Interesting. Very interesting to be sure, but unexpected. I mean Ralph Dibny has the Helmet of Fate. I don't know if it makes any sense, but considering this book has been a series of unusual situations I guess it fits right in. But I'll get to that in a second. The Black Adam/Isis and Renee/Question storylines came together nicely in this issue. I've wanted this to happen since Renee and Victor hit Kahndaq, though the journey to this moment was very satisfying. It makes sense that Adam and Isis would want to reward Vic and Renee for their actions and it also makes sense that Adam couldn't see why Renee would be upset over killing the child. He sees her absence as an insult, which led me to think, humorously of course, "That is so like him." In terms of pacing the abruptness of the transition from Vic explaining Renee's actions to Adam standing in the opening of a giant hole in the wall demanding an explanation for why Renee was drunk and in bed with one of his citizens was both funny and dramatic. I honestly believe that it wouldn't have mattered to Adam if she was in bed with a man or a woman. It was the insolence of standing him up that was the problem. The back and forth between Adam and Renee was awesome, but the subtle aspects of the scene, like the expression on Vic's face and Isis escorting Renee's "friend" away from the conflict, made for a solid experience. As ever Isis and Vic act as the voice of reason, which is interesting to me because that is something they have in common. While Renee and Vic aren't involved romantically he has provided her with a focus, whether she liked it or not. Isis has had a calming effect on Black Adam as well. The result is that now the four will hopefully work together to put an end to the Intergang problem. Of course the writers of this series have made it abundantly clear that nothing will ever go in a way I could guess at, so this could either be a really good thing or go horribly wrong. This brings me back to Ralph and the Helmet of Fate. The one thing this series isn't short on is ideas. Johns, Rucka, Morrison and Waid are all very imaginative writers and this series has benefited from their ability to come up with all kinds of neat concepts. While the Croatoan Society got all of three pages of screen time you could tell from the bits of business on the walls and the way the characters interacted that there was a lot of history there. Part of me is aggravated by this because it seems like I'm missing something but at the same time I was intrigued, especially with the people involved. The thing is that the Croatoan Society wasn't the point of the scene. It was great set dressing, but the image of Tim Trench transforming into a pool of liquid on the floor was what made the opening of this issue so strong. I mean how much more of a, "What the..." do you need? The Croatoan Society was a means to an end and that end was Ralph Dibny. I honestly don't know how to feel about Ralph agreeing to go through the journey the Helmet offered. I do know that I loved the dialogue between him and Detective Chimp in France and I dug the heck out of the fact that the offer the Helmet made may have all been in Ralph's head. But what this could mean leaves me a little uncertain. What I'm not going to do is go off on a rant about how Ralph couldn't possibly become the new Dr. Fate. For one thing I don't know if this is going to happen, so speculating wouldn't get me anywhere. For another thing it doesn't really matter. If DC and the writers and editors involved want Ralph to be the new Fate then he will be the new Fate. It could succeed. It could fail but there isn't a whole heck of a lot that I or any other reader can do about it. Complaining doesn't work and is counter-productive as well. Ralph could be the new Dr. Fate. Or he could be a piece in the puzzle of the creation of the new Dr. Fate. I don't know. All I can do is keep reading and hopefully be entertained. Still, it would be kind of interesting if Ralph did become the new Dr. Fate. But it would be even more interesting if he was just off his rocker crazy. Oh and there may be a new Booster Gold. Pass it on. Art - 4: In my story review I made several references to how the visuals really sold certain aspects of the story. I cannot adequately describe how much the art and writing came together to make this a really great comic book. Eddy Barrows and Rob Stull (working with Keith Giffen's breakdowns) put a lot of detail into the backgrounds and the storytelling was very, very strong. The highlight of this issue, for me, was Black Adam confronting Renee Montoya. The image of Adam standing before her with the giant hole in the wall behind him was great. More than that I liked how the scene played out visually. Even without the dialogue you can see how annoyed, and somewhat addled by alcohol, Renee is and how angry Adam is becoming at her insolence. This is where Keith Giffen's breakdowns shine. He knows how to set up a page, but Barrows and Stull are the ones who gave the scene its emotional resonance. I was also impressed with the magical mystery tour page. I mean it had Amethyst. How cool is that? Wait, don't answer that. I may be the only one who likes Amethyst. Backup Story - 4: God these things are hard to review. Its two pages. How do you break down two pages of something that is primarily exposition? Waid makes it work, though. He gives just enough information to let you know who the person is and then makes recommendations about which books to read to find out more. I was amused that one of the recommendations is a thirty-six issue series, but from what I understand it is a damn good read so I can't argue too much. This was another good origin. Mark Waid is the man. That's all I have to say. Art - 4: Joe Bennett draws one smooth looking Question. Like the writing the art doesn't tell a story so much as gives emotional beats that are important to the character. In this Bennett did a fantastic job and I was very pleased with the result of his efforts. Cover Art - 5: J.G. Jones keeps delivering the most amazing covers. This week's cover may not have been my favorite of the series but it was still fantastic. The lettering really sold the noirish feel the piece had and it is a testament to Jones' talent that he put Detective Chimp on the cover and made it work. DC used this cover in their hype for the series and I can see why. I sincerely hope that DC goes through with putting out a collection of the covers. They certainly deserve it.